Bought by Jamie and Miranda Landale in 2003, Clathic comprises 210 acres of pasture, hill and woodland. At the time of purchase, grazing licences amounted in total to a few hundred pounds per year, the majority of the land was neglected, overrun with nettles, thistles and bracken, and most of the fencing was not stock proof. In 2010 after looking at different options including forestry and sheep, the ground was cleared of weeds to establish a deer operation. As there were a number of deer coming from local forestry and hill ground to winter on the Clathic hillside it was reasoned that deer might like the habitat. Jamie and Miranda recognised their responsibility to look after the land and return it to a usable and viable state, and also that this would require a certain cash injection because of its state of neglect. The aim was, and still is, to let the deer be as natural as possible. The paddocks are large and include woodland, lochs, crags and gullies as well as pasture. Calves are wintered outside and the deer are left in larger mixed groups, although most of the calves were taken off their mothers this last winter to control winter feeding regimes more easily. One aim was to get the land generating more than the grazing licences without having to employ additional resource and this has now been achieved. One employee works on everything from gardening, to maintenance, and deer. 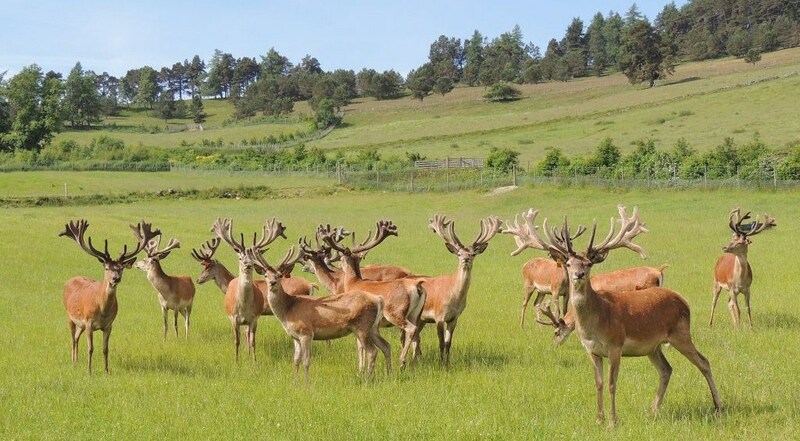 In 2015 the deer will make a valuable contribution towards the running of Clathic — a contribution that will rise when live animals also start to be sold. The herd has developed from a mixture of local woodland capture, bought stock and natural growth. For the first time the calves have been tagged so identifying those from the Woburn strain. They were also wormed at the same time. Clathic makes it own silage for winter feed, supplemented with carrots, turnips and parsnips. Culling is undertaken in field. Clathic has a larder facility and consideration is also being given to the sale of live animals or use of the Downfield (Fife) abattoir in the future. A main market has been Highland Game who have supported the project from the outset, and home produced butchered products (using a local butcher), are also sold to friends, local restaurants and retailed through farmers’ markets. Clathic is based just off the A85. The deer enterprise and the ground on which it is based now makes a contribution towards the upkeep of the farm. The ground has improved beyond all recognition, and the health of the deer is very good. Although the project is young it can demonstrate what can be done with a previously neglected piece of hill ground in a relatively short period with modest investment. The Deer enterprise at Gledpark over some 40 acres was initiated in winter 2012 with a best practice layout drawn up in conjunction with the Venison Advisory Service. May 2013. The first calf crop was born in June 2014, the males from which will be sold on this summer 2015. A second calf crop will be born in June 2015 resulting in a stock level of 70–80 this summer. With the spend to set up the enterprise all incurred in the last 24 months, very accurate and indicative costings are available. A particular feature of Gledpark has been establishment without any grant funding, successfully utilising existing vernacular buildings for the covered handling and weighing system with no compromise in quality. The galvanized weigh box is a unique design featuring a slide in-and-out platform cattle scale so removing the need to purchase additional equipment for farmers already weighing cattle. This has generated commercial interest in its own right. The deer are kept outside all year round, with the enterprise currently on the most marginal and difficult acres of the farm. Of interest to the project, the deer, with their need for forbs and woody browse, have been instrumental in securing Region 1 status for their enclosures under the coming CAP. The farm produces its own haylage bales which provide supplementary feeding from December. The unit is able to demonstrate Scottish Native Provenance in all its stock — a key element for its marketing and health status. The farm is also the first UK business to become assured under the BDFPA/SFQC Park Venison Assurance scheme (member 001) Successfully hosting the assessment in Nov 2014 and achieving the standard required at the first attempt. Gledpark is also one of the NFU Scotland Renewable Demonstration Initiative Farms and a host farm for the Royal Highland Education Trust (taking groups of P1 to P3). Gledpark is easily accessed from the A75 in south-west Scotland. It strives to be an example of agricultural best practice; through assurance, health testing, utilising wind and solar in renewable projects, with its own water capture systems and increasing pollinators by currently hosting 25 bee hives. Plans for the deer enterprise in 2015 include the creation of a further paddock to allow for an increase in stock and the launch of a website. Approx 77 hectares (190 acres) is fenced for deer farming. 55 ha (136 acres) improved land. 22 ha (54 acres) rough grazing. This is divided into 15 fields. 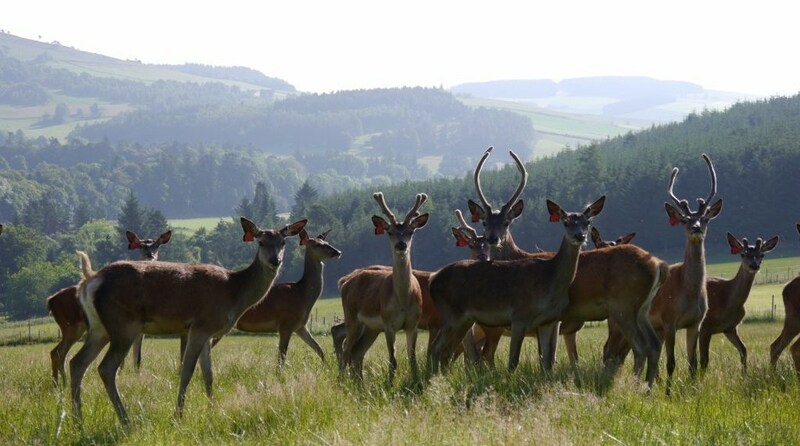 The deer farming enterprise at Culquoich is focused on producing deer of the highest quality, both for venison production and breeding stock sales to other farms. The enterprise has grown steadily over the past 10 years and continues to expand. We are constantly looking at new and innovative ways of improving the farm and increasing the performance of the deer herd. Selection as the Deer Farming Demonstration Unit will allow that experience to be shared with prospective farmers, as well as demonstrating best practice in current deer farming techniques. The enterprise has been running since 2004, giving 10 years experience in active deer farming. In that period the herd has expanded from 40 hinds to over 150 hinds. The unit has been run almost entirely single-handedly, illustrating the low labour input required. The farm consistently produces top quality deer for venison and breeding. In 2010, 2011 & 2012, the farm produced the best carcases in a UK-wide producer group (heaviest yearling stags). The farm has been Quality Assured under the SAI Global Farmed Venison Assurance Scheme since 2009. All aspects of deer farming have been carried out including: weaning, worming, de-antlering, DNA sampling, EID tagging, weight recording, health testing for export. The business has utilised a number of grant schemes, including the Farm Business Development Scheme and the Scottish Rural Development Scheme, to establish and expand the enterprise. The major output from the farm is venison. 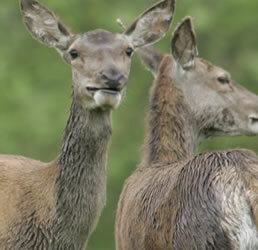 This is marketed as part of the First Venison producer group and sold to a major retailer. Culquoich is also a producer of breeding stock for other farms, including stags as well as hinds. The enterprise also produces and sells deer squeeze crushes. The farm is situated in a Less Favoured Area. Soils vary from Class 3.1 arable ground to Class 5 hill ground. Crops/forage include: temporary and permanent grass/clover leys, arable silage, spring barley & rough grazing. Previously Quality Assured for cereals with SQC. A field of chicory will be sown in 2014. Soil testing is carried out regularly, most recently in December 2012. Very high quality silage was grown in 2013 which won first place at the Royal Northern Spring Show for baled silage. A purpose built set of covered handling pens, with a squeeze crush, is used for handling the deer. The pens include a weigh facility which is EID and Bluetooth compatible. Two modern buildings house deer calves in the winter using two different feeding methods. As the farm has developed, different fencing systems have been used which illustrate the variety of techniques and materials available.